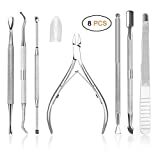 【Professional Cosmetic Tools】Including seven different beauty tools (Eyebrow Scissors, Slant Eyelash Tweezers, Curved Extra Fine Point Slim Tweezer, Cuticle Pusher and Cutter, Triangle Nail Polish Cuticle Remover, Acne Blackhead Comedone Lancet, Ear Pick, Cleaning Brush), This is a fully functional beauty tool, Complete care that covers your face and hands. 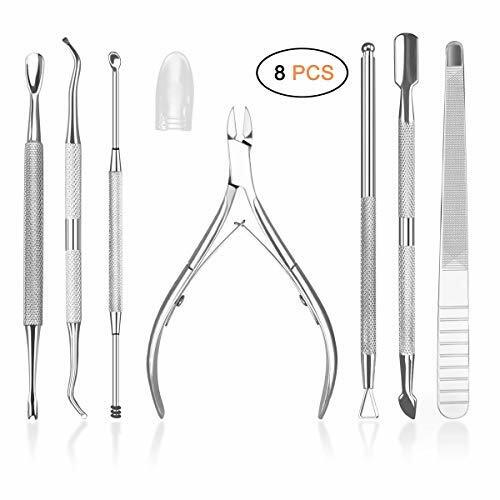 【Premium Material Tool】HIFAU's 7 sets of cosmetic tools are made of surgical grade stainless steel with polishing finished, Process luster, comfortable texture, long service life. Which plays an important role in helping to better control the pressure during use, ensuring every step can be done accurately to avoid damage to the skin. 【Convenient Packaging】We combine user needs, HIFAU's 7 sets of beauty tools, using artificial leather bag packaging, easy to carry, you can take it anywhere, suitable for travel or business trips. 【Perfect Gift For Your Beloved】Give your beloved such a set of 7PCS hairdressing tools of full function, perhaps she will throw away old, your gift will become her belongings, this is a how happy thing. 【100%SATISFACTION GUARANTEED】We try to make the best product and satisfying after-sales service. If our products has any defects, you can contact us, and we will send you a brand-new product with the fastest speed.